When you are in the mood for something different, when a burger (albeit temptatiously tasty) just won’t do, Indian-spiced chicken with roasted slices of butternut squash and toasted cashews is the definitive answer to the age-old question: “What’s for dinner?”. Chances are good that you have never had it before, neither while dining out, nor cooking in. It is a chance to learn something new, at the same time rediscovering flavors of the east, in the most Paleo way possible. Curious yet? Let’s get to the ingredients. Begin with 2 boneless, skinless chicken breasts – double everything in the recipe if you are cooking for 4 people. Hunt down that organic free-range bird at your local butcher or supermarket and slather the chicken breasts with spices, coconut oil and lemon juice, then let them sit for 20 minutes in the marinade. Chicken breasts can be pricey, so what to choose when you can’t afford the best? You could substitute some fattier cuts for the lean breasts, buy in bulk when you can find it – then store in the freezer, or fry up some ground chicken in the same spices. It’s all about being resourceful, use what works best for you! Serve the chicken over plenty of fresh greens and make sure to toast those cashews to perfection. They are more than a garnish – cashews contain high levels of copper and magnesium, improve your blood circulation and their buttery texture makes a wonderful curry paste. Combine all the butternut ingredients together and mix well. Transfer to a baking dish and place in the oven. Allow to roast for 40 minutes until the squash is cooked and slightly caramelized. For the chicken, combine all the marinade ingredients, pour over the chicken and allow to marinate for 20 minutes. Cook the chicken in a hot pan until golden brown and cooked through. Remove the chicken from the pan, then add the cashews and allow to toast. Combine the coconut milk, honey, lemon and salt; mix well to make the dressing. 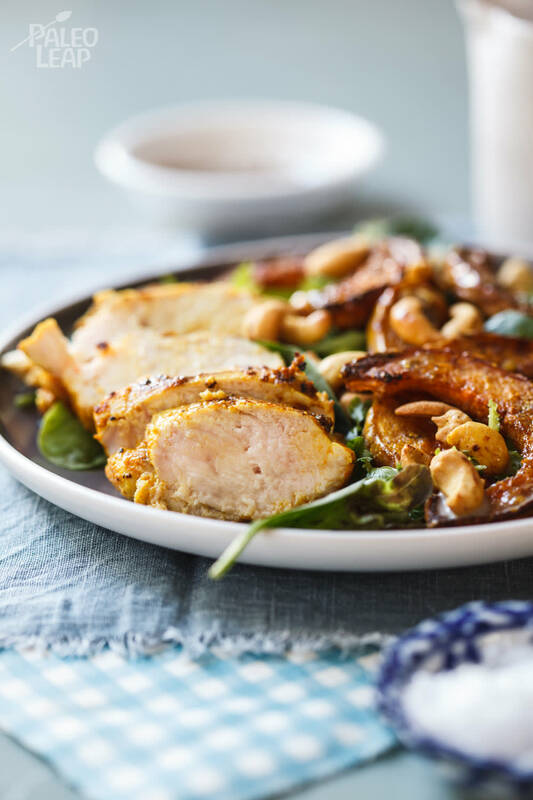 Slice the chicken and serve on a bed of baby lettuce leaves along with the roasted butternut squash and toasted cashews.